The Fisheries department, government of Gujarat, Gandhinagar had invited applications for the post of Fisheries officer (Matsya Adhikari) Class-III (46 vacancies) and Fisheries officer (Matsya Adhikari) Class-III (8 vacancies) under the Advertisement No: GF/201213/2 and GF/201213/4 respectively during 24/09/2012 to 15/10/2012 and 12/01/2013 to 19/01/2013. Applications were invited online through the website http//ojas.guj.nic.in or http//ojas1guj.nic.in. 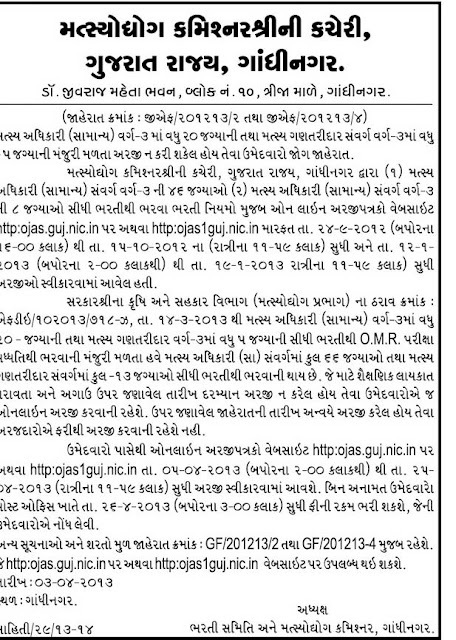 Government of Gujarat and Fisheries Department has issued notification to increase the vacancies by 20 posts in Fisheries officer (Matsya Adhikari) Class-III and by 5 posts in Fisheries officer (Ganataridar). The selection for actual post will be made after OMR examination. For these vacancies, only qualified candidates and candidates who have not applied before may make online application through official website (mention below). Educational Qualification & other instructions: Educational qualification, experience, age limit and other details will be same under Advertisement No: GF/201213/2 and GF/201213/4 which is given in below given links. Dates to remember: Candidates may apply online from 05/04/2013 (from 2:00 PM) to 25/04/2013 (up to 11:59 PM). Unreserved category candidates can pay application fees on or before 26/04/2013 up to 3:00 PM. For more details, candidates are requested to read original advertisement. I have apply for fish ring officer on 25/9/12.can I reapply for this post. What is qualification of this post...? can you plz tell Educational Qualification for post of fishrish officer. Qualification for Fisheries Officer: Graduation in Fisheries science or B.Sc. with Zoology or Microbiology. Qualification for Fisheries Enumerator: 12th with Maths or same education with Maths. what is Creamy Leyer Certificate Date? My t.y.bsc exam completed in this month, my result will come on next month. Can i apply for this post? I Fisheries Enumerator ma form bharyu 6e to teni exam kyare ane kya aapvani hoy 6e ? Exam center Ahmadabad raheshe, and exam date have pachhe declare thashe. Sir any study material is available for fisheries officer..and what is the exam centre 4 this post?thanks.. Exam center Ahmedabad chhe, any study material not available, you can use any publication's books for preparation. me online applicatin kari che OJAS through but Print call letter ma select job ma jav chu pn job selection ma aavti nathi tene lidhe hu call letter print kari sakto nathi. exam 26.05.2013 na roj che.